Heyford Winding Hole is a minor waterways place minor waterways place place on the waterways major waterways place village town city on the Grand Union Canal (Grand Junction Canal - Main Line - Norton to Gayton) between Heyford Wharf Bridge No 32 (Nether Heyford village half a mile northeast. Many moored boats in this area) (1¾ furlongs to the northwest) and Gayton Junction (Junction with Grand Union Northampton Branch) (4 miles and 5¾ furlongs to the east). 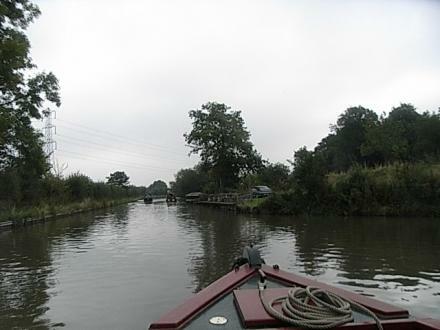 The nearest place in the direction of Gayton Junction is Faulkners Bridge No 33; 1 furlong away. 22 The Green, Northampton, NN7 3LE — 993 yards to the northeast. Furnace Lane, Nether Heyford, Northampton, NN7 3LB — 339 yards to the west. 24 The Green, Nether Heyford, Northampton, NN7 3LE — 993 yards to the northeast. Furnace Lane, Northampton, NN7 3LB — 406 yards to the west. Bridge Cottage, Furnace Lane, Northampton, NN7 3JY — 365 yards to the northwest. Middle Street, Northampton, NN7 3LL — 1449 yards to the northeast. Unit 2, Old Dairy Farm Craft Centre, Northampton, NN7 4SH — 1605 yards to the southwest. Bugbrooke, Northampton, NN7 — 1067 yards to the east. 23 Church Lane, Northampton, NN7 3LQ — 1138 yards to the north. melange HQ, Northampton, NN73LQ — 1158 yards to the north. A5 Watling Street, Upper Stowe, Northampton, NN7 4SE — 1021 yards to the southwest. The Studio, Northampton, NN7 4DG — 419 yards to the northeast. Furnace Lane, Nether Heyford, Northampton, NN73LB — 305 yards to the northwest. 18 Church Lane, Nether Heyford, Northampton, NN7 3LQ — 1199 yards to the north. winston close, Northampton, NN7 3JX — 583 yards to the north. Bliss Close, Northampton, NN73ND — 898 yards to the north. Furnace Lane, Northampton, NN7 3LB — 330 yards to the south. 25b The Green, Nether Heyford, Northampton, NN7 3LE — 977 yards to the northeast. Northampton — 1346 yards to the northeast. 10 Middle Street, Nether Heyford, Northampton, NN7 3LL — 1141 yards to the northeast. Northampton, NN7 3LQ — 1158 yards to the north. Nether Heyford, Northampton, NN7 3NG — 615 yards to the northeast. 1 Scirroco Close, Northampton, NN3 6AP — 675 yards to the northeast. 51 Furnace Lane, Northampton, NN7 3JS — 658 yards to the north. 21 bliss close, Northampton, NN7 — 915 yards to the north. New Creation Farm, Furnace Lane, Nether Heyford, Northampton, NN7 3LB — 354 yards to the south. Northampton — 699 yards to the northeast. Northampton — 1137 yards to the north. Northampton — 997 yards to the northeast. The Church Rooms, Church Lane, Nether Heyford, Northampton, NN7 3LQ — 1153 yards to the north. Northampton, NN7 3 — 939 yards to the northeast. Northampton — 963 yards to the north. New Creation Farm, Furnace Lane, Northampton, NN7 3LB — 404 yards to the south. 26 The Green, Northampton, NN7 3LE — 971 yards to the north. Northampton, NN7 3LP — 750 yards to the northeast. Northampton — 757 yards to the northeast. 1030 yards to the west. 1463 yards to the southwest. 781 yards to the east.